Why, oh, why are you the country of dream phones, Japan? Just when we thought we are catching up after years of superior Japan-only handsets, NEC comes out with the NEC MEDIAS N-06C. It still stays slimmer than the Samsung Galaxy S II, but is slightly thicker than its MEDIAS N-04C predecessor. 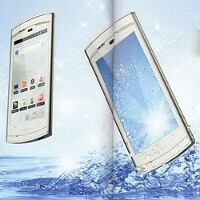 However, it comes with Android 2.3 Gingerbread (the N-04C was running Froyo), and is waterproof up to 3 feet. The chipset has also been bumped to the modern 1GHz, and the rest of the specs stay the same - 4" display with 480x854 pixels, 1GB RAM/512MB ROM, and 5MP camera with LED flash and HD video recording abilities. 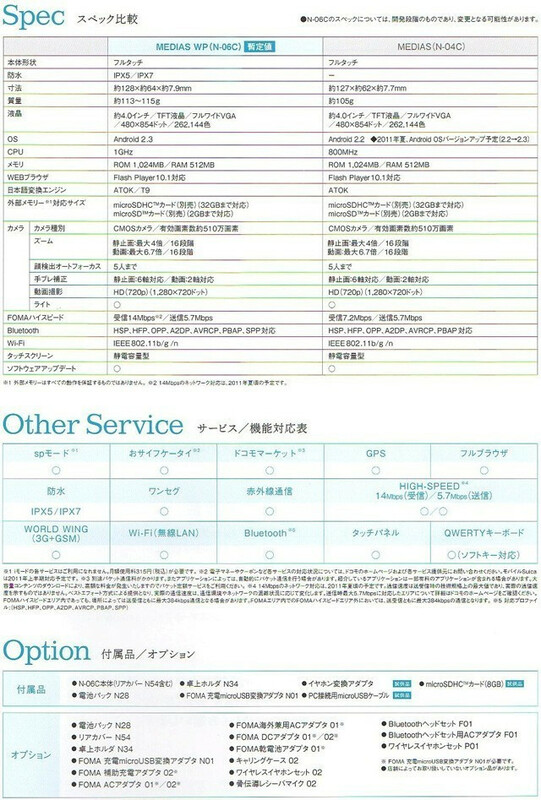 The data connection is taken care of with 14.4Mbps download speeds on NTT's FOMA network. 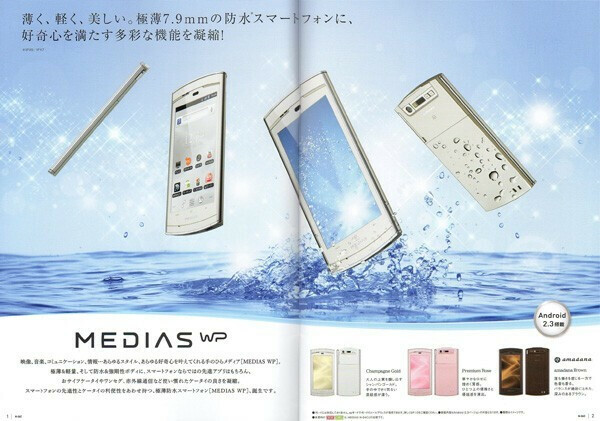 Nippon Electric Company swaps the physical buttons on the NEC MEDIAS N-04C with touch buttons in the N-06C, and, despite its IPX7 waterproof category, the phone is only 0.31" (7.9mm) thick. Its predecessor was 0.3" thick, and carries the crown for the world's thinnest Android handset. We don't know if the NEC MEDIAS N-06C will ever make it outside of Japan and NTT DoCoMo's confines, although we are willing to sign somewhere for it, but on the right is the spec sheet to drool over the physical dimensions of this Slim Jim. Not to mention it seems to come in a few color combinations, including the all-time favorite pink, and will probably grace the summer lineup of NTT DoCoMo. with the introduction of wireless charging, we may see more phones that are waterproof, and thats a plus :D now where do we make the line? This isn't even the nicest of the summer 2011 lineup. Well it depends on your taste really.